Sport Canterbury staff are getting behind CEO Julyan Falloon, General Manager Bruce Morton and Community Sport Advisor Zara Taylor who have entered the Kathmandu Coast to Coast Two Day event three person Corporate Challenge as the organisation looks to encourage local councils and sporting organisations to also take on the event in February. 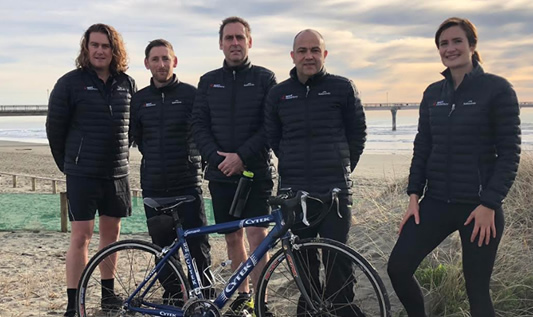 Pictured ( left to right) near the finish line on New Brighton Beach are Sport Canterbury staff Event Coordinator Isaac Sutherland, Justin Mitchell from Active Families, CEO Julyan Falloon, General Manager Bruce Morton and Rebecca Logan from the Community Strength and Balance team. Sport Canterbury has in-depth experience in community sport, event management and physical activity. They deliver programmes and events to teachers, coaches, sporting organisations, health professionals and people of all ages across the Canterbury West Coast region. With Regional Sports Trust offices in Christchurch, Mid Canterbury, South Canterbury and the West Coast, everything Sport Canterbury does is about getting, and keeping, people engaged with sport and physical activity.